Thanks to new agreements between Texas Parks and Wildlife and private landowners, anglers have easier access to The Canyon Reservoir Tailrace—one of the top trout fishing destinations in the United States. 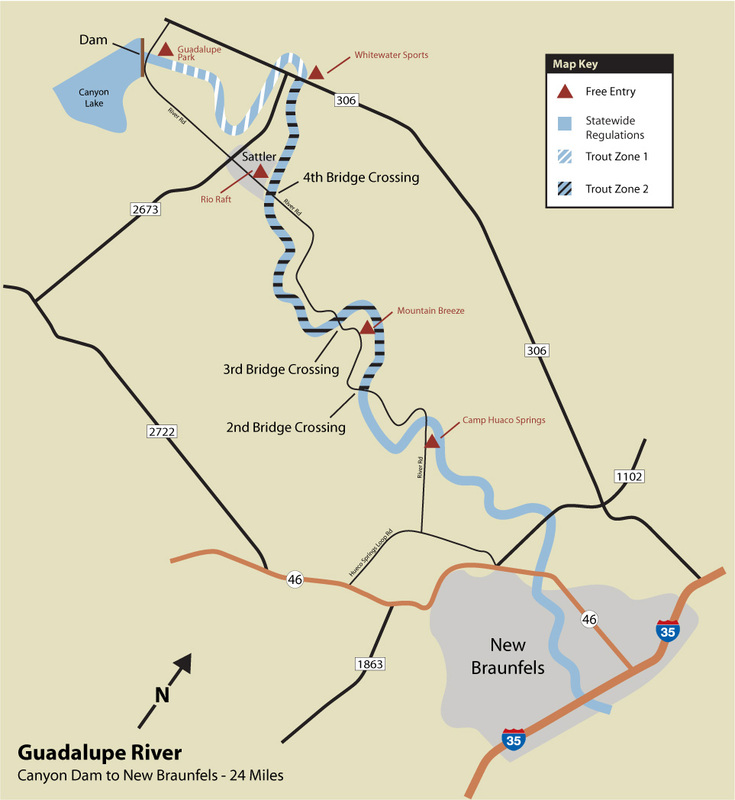 Texas Parks and Wildlife Department leased four access areas from private landowners along this coveted stretch of water, located below Canyon Reservoir on the Guadalupe River. By leasing prime fishing locations from private landowners Parks and Wildlife provide anglers with a unique trout fishing experience in Central Texas. Through late spring, the “no fee” leases give anglers the opportunity for bank and wade fishing – as well as put-in and take out areas for kayaks and paddling equipment. Texas Parks and Wildlife will continue to stock the Canyon Reservoir Tailrace with thousands of rainbow trout each week through late-January. Visit the Texas Parks and Wildlife website for the locations of the new access points along Canyon Reservoir Tailrace, and the full list of trout stocking dates. Before you can sell seashells by the seashore, you first have to find them. I feel the best time to go shelling is in the wintertime. Paul Hammerschmidt is a lifelong shell collector. He says winter storms churn up the Gulf bottom, sending shells onto the beach. Improve your chances of finding intact shells when you avoid crowded shoreline. If you get a chance to go to some more isolated beaches, like down on Padres island, or something like that, where the population of humans is not quite so thick, you’ll have a much better chance of finding some really unusual shells. 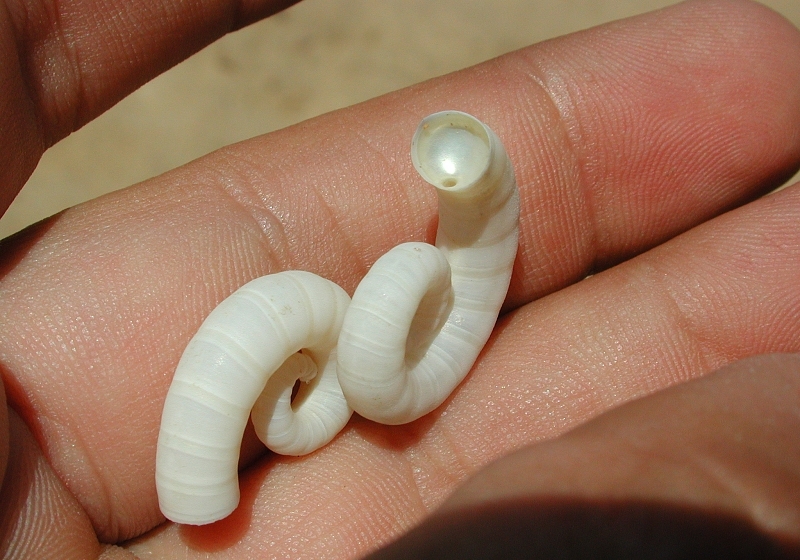 Such as a sweet little shell called baby ears, or another special shell worth searching for called spirula. And it’s a coiled, snail-like shell. But it doesn’t belong to a snail—it belongs to a little squid. And it’s inside the squid, and when the squid dies, that little thing has a lot of chambers in it with gas, and it floats and washes up on the beach. Those are very pretty, bright white, and they’re very fragile, so you have to be careful with them. This winter, instead of heading to the slopes for skiing, go to the beach for shelling…you can still have hot cocoa when you’re done. Saturdays through the end of February Ranger Lisa leads shell hunting, identification and collecting workshops at Galveston Island SP. Find details in the calendar section of the TPW website. 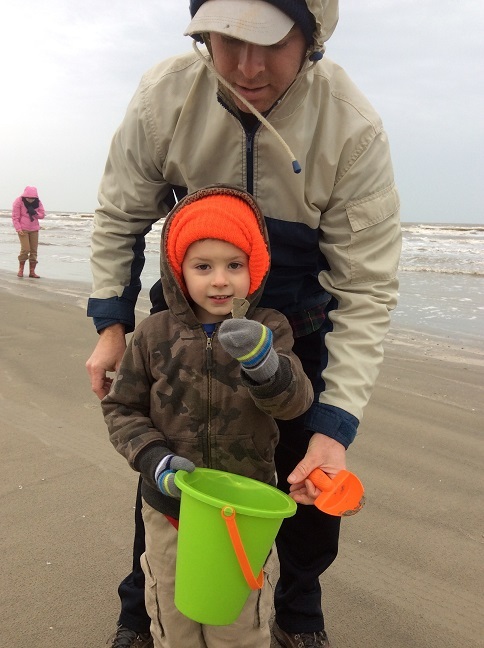 Beachcombing on Galveston Island in Winter. Nobody thinks twice about collecting shells from the beach. But I started to wonder if it’s really okay since beaches are public land. It’s okay to collect shells. The ones that are broken and come apart, they create the sand that’s out there, but there is no law against it [collecting]. Paul Hammerschmidt, retired from coastal fisheries, is a lifelong shell collector. He says collect responsibly to avoid creating problems for the environment or marine animals. I highly recommend that you only take shells that are from dead animals—not live animals. How can you determine if something is still alive? In the case of the popular sand dollar, small spines cover the shells of living animals…so look for smooth, spineless shells. If, like me, you’ve never found a sand dollar on the beach—there’s good reason for it. I think it’s because everybody wants to get a sand dollar. And, too, they’re another very fragile shell. And when the waves are strong, they’ll get broken up, and you’ll just see fragments of them. A lot of times, the best time to find a sand dollar, is after a storm—and then very early in the morning—before anybody else gets out on the beach. More tips on when and where to go shelling tomorrow. We record our series in Austin at the Block House. Joel Block Engineers our program. 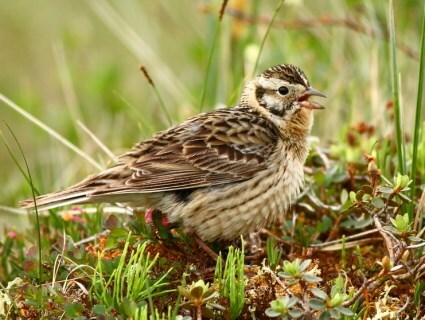 The Smith’s Longspur, a subarctic songbird, is the ultimate “snowbird”. It travels from Alaska and Canada to Northeast Texas where it spends the winter months. It’s remarkable migration for a little bird the size of a chickadee. And he flies all the way by himself; he’s been doing this for millennia. Ornithologist, Cliff Shackelford says based on winter surveys, this grassland species is in decline. Parks and Wildlife has a project where we go out and we survey for Smith’s Longspurs. There’s several staff involved where we go out every winter and we spend several days looking for Smith’s Longspurs, and talking to landowners. We’re trying to encourage them to leave native prairies for these species, and to be on the receiving grounds for this really neat wintering bird. Changes in land use can cause a reduction in habitat for this migrating bird. My hope for the Smith’s Longspur is that it could be with Bobwhite and other grassland birds, poster children for protecting prairies and protecting them in big swaths. A lot of these grassland birds need a lot of real estate. So, we can’t just do two acres here and five acres there. It needs to be hundreds and hundreds, if not thousands of acres, for these birds to survive. Landowners are key to the future of the Smith’s Longspur and other native grassland species. Texas is the place to see migrating bird species in the winter months. Just be prepared for seasonal changes in their plumage. 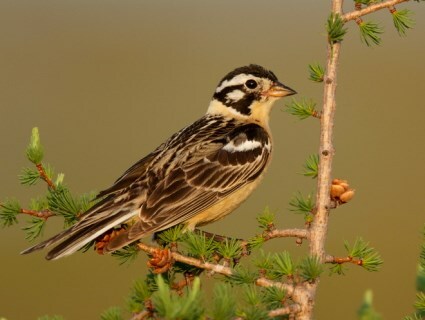 The Smith’s Longspur, for example, is usually a brightly patterned songbird. In the winter, they lose their bright, breeding plumage and they become very drab. Ornithologist, Cliff Shackelford says another factor that makes this species somewhat of a challenge to spot is that it lays low. They’re grassland skulkers, meaning: they don’t sit up on fence posts or limbs very often, or at all. They really like to sit on the ground in the grass. Their drab winter feathers make them even harder to spot in the dry brown grasses. But it can be done—if but for a moment. So, the way to see a Smith’s Longspur is to be in the right part of the state. Maybe Hunt county; that’s a really good place. And, if you had the right grass at the right height—about ankle deep—you’ll kick ‘em up. And there’ll be 50 to 500, and they’ll fly, and they make a rattling sound. That’s really all you get. You don’t really get to look at them very well. When they land back down in the ground near you, they are in the grass and very hard to see. A decline in the Smith’s Longspur in Texas…that’s tomorrow. You are currently browsing the Passport to Texas weblog archives for January, 2018.